After Bernie Sanders’ win in today’s Democratic caucus in Wyoming, the election enters an extended intermission until the next big contests in New York on April 19 and Pennsylvania on April 26, making this a good time to put where we are in perspective. The two figures below depict the number of delegates awarded by Republicans and Democrats on each date with a primary contest, starting with Iowa on February 1, along with how those delegates are allocated between the respective frontrunners (Trump and Clinton) and everyone else. The bars are cumulative, with the green bars on the right representing primary and caucus dates to come. The horizontal line running across both figures represents the number of delegates required for the nomination. Notice how few delegates were awarded in the first month, when so-called “critically important” contests were held in Iowa, New Hampshire, Nevada and South Carolina? If we were to plot media coverage of the election on top of this figure, it would almost certainly be at its peak during those first few weeks, making the critical importance of those early contests entirely about their critical importance to reporters. Losing candidates are right to complain that their failure to perform well in small, unrepresentative states with few delegates shouldn’t cause them to drop out (a complaint invariably heard just before they drop out). It’s also clear that a lot of delegates remain to be selected. Republicans didn’t award 50% of committed delegates until March 15. Democrats haven’t gotten there yet. And we’re not going to see much movement after Pennsylvania until the very end. Delegate allotment will be flat between April 26 and the final burst of primaries on June 7. For the better part of six weeks, reporters are going to have to move the narrative without much in the way of new results. 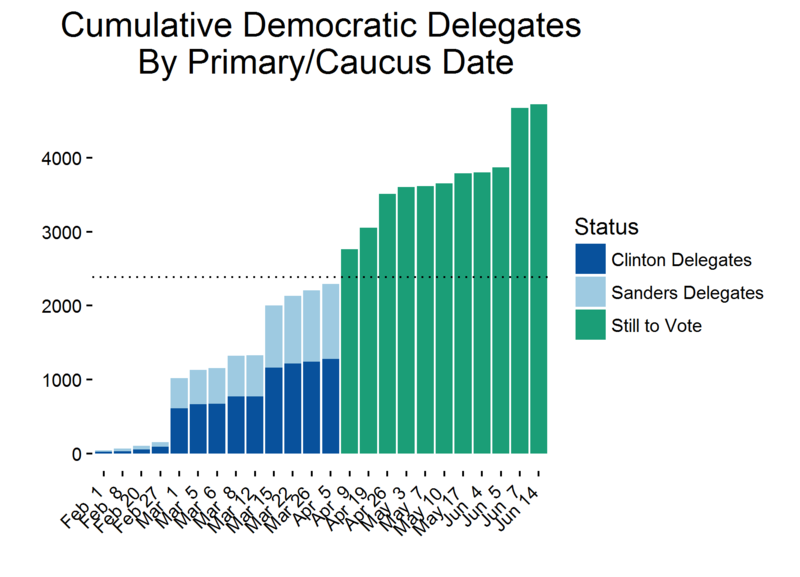 Finally, check out the trajectory of delegate collection for the frontrunners relative to their opponents. Donald Trump experienced two big jumps in his delegate count: during his commanding victories on Super Tuesday (March 1) and when he cleaned up in Florida, Illinois and North Carolina on “mini-Tuesday” (March 15). There were a few other smaller jumps, like the one following his winner-take-all victory in Arizona on March 22, but otherwise his delegate accumulation has been relatively flat. He has a path to winning the nomination outright, but it is not at all clear from the trend lines that he will. On the Democratic side, absent superdelegates, the contest looks close. Bernie is behind, but not massively. 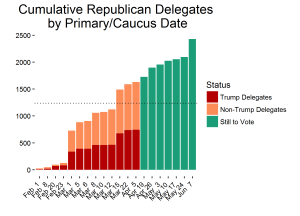 His problem becomes apparent when you look at the trajectory of his delegate accumulation relative to Hillary. They’re both taking steps toward a majority, and he has made small gains on her over the last few contests, but unless Hillary’s support collapses in large states like New York, Pennsylvania and California, she’s going to get there first. Democrats award their delegates on a proportional basis, so Hillary has continued accumulating delegates despite her recent losing streak. We will update these figures as the contest moves on. Many thanks to Sharon Machlis for her graphics expertise.